Look: LISTERA CORDATA (L.) R. BR. It is included in the Red List of Belarus of the 1st and 2nd editions (1981, 1993). 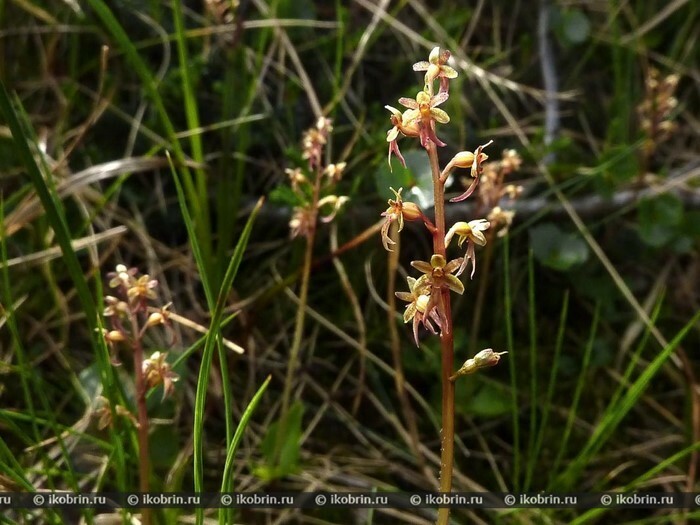 It is protected in Ukraine, Latvia and Lithuania. It is included in the Appendix II to the Convention SITES. Perennial grassy plant with a creeping thin rhizome and a thin stalk from 6 to 15 high (22) cm. The stalk at the basis with 2 brownish vaginas, is closer to the middle to 2 small sedentary, triangular and heart-shaped, opposite leaves (up to 2,5 cm long). Flowers small, are collected till 4-12 in a rare brush. The lip without shporets, is twice longer than leaflets of an okolotsvetnik, oblong, to the middle divided into 2 narrow pointed blades. External leaflets of an okolotsvetnik green, internal and a lip - rather dirty-purple. A fruit - a dry box. Eurasia (plains and mountains) and North America. The Golarktichesky tsirkumborealny look which is in Belarus in the isolated localities on southeast border of the European fragment of an area. It is authentically known in Volozhinsky district of the Minsk Region, Ivyevsky district of the Grodno Region, Osipovichsky district of the Mogilev Region, Verkhnedvinsky, Gorodoksky, Lepelsky, Polotsk, Postavsky, Rossonsky and Sennensky districts of the Vitebsk Region, Ivatsevichsky and Pruzhansky districts of the Brest Region. Earlier it was noted in Glubokskom (of Podsvilye) and Gorodoksk (Rudnya) districts of the Vitebsk Region. Eurasia (plains and mountains) and North America. The Golarktichesky tsirkumborealny look which is in Belarus in the isolated localities on southeast border of the European fragment of an area. It is authentically known in Volozhinsky district of the Minsk Region, Ivyevsky district of the Grodno Region, Osipovichsky district of the Mogilev Region. Verkhnedvinsky, Gorodoksky, Lepelsky, Polotsk, Postavsky, Rossonsky and Sennensky districts of the Vitebsk Region, Ivatsevichsky and Pruzhansky districts of the Brest Region. Earlier it was noted in Glubokskom (of Podsvilye) and Gorodoksk (Rudnya) districts Vitebsk regional. Crude and boggy coniferous forests, mainly mossy, moss bogs. Is the indicator of sour soils. The shade-loving plant, on the open lit places meets seldom. Blossoms in June - July. Entomofil. Fructifies in July - August. Anemokhor. Reproduction seed and vegetative (root offsprings). Meets separate individuals and small groups. Drying melioration of bogs and boggy woods, cabins of the wood of the main use, economic transformation of lands. "Vygonoshchanskoye" (Ivatsevichsky district), in the territory of the designed landscape wildlife area "Naliboksky dense forest" (Volozhinsky district) grows in the Berezinsky biospheric reserve, National park "Bialowieza Forest", the landscape wildlife area "Osveysky" (Verkhnedvinsky district), hydrological wildlife areas of "Shvakshta" (Postavyosky district) also. The organization of botanical wildlife areas in all revealed locations with prohibition of anthropogenous influences, the constant control of a condition of the known populations and search of new places of growth are necessary. It is necessary to study opportunities and features of cultivation of a look in culture.